Vito Volterra (1860-1940), president of the National Council for Research from 1923 to 1927, studied at the Scuola Normale Superiore in Pisa and in 1882 he ﬁnished his doctoral dissertation in Physics about hydrodynamics. Volterra was appointed professor of rational mechanics at Pisa in 1883. In 1892 he became professor of mechanics at the University of Turin, and eight years later he accepted the chair of mathematical physics at the University of Rome. He was co-founder of the Italian Physical Society (1897), founder and the first president of the Italian Society for the Advancement of Science (1907). In 1905 he became a senator of the Kingdom of Italy. In 1923 he was elected chairman of the Academy of the Lincei. But in 1931, as a firm opponent of the fascist regime, he refused to take the oath of allegiance, with the result that he was dismissed from his professorship at the University of Rome, and subsequently, expelled from all Italian academies. He held the position of Chairman of the Bureau International des Poids et des Mesures, with offices in Paris. Vito Volterra was a physicist and a mathematician of great prestige and influence with a strong belief in the importance of science to the societal progress. Guglielmo Marconi (1874-1937), president of the National Council for Research from 1927 to 1937, started conducting experiment in 1895 in order to demonstrate that communication among people was possible via wireless radio signaling. In 1896 Marconi traveled to England in order to get a patent for his apparatus (number 12.039) and in 1897 he established the "Marconi’s Wireless Telegraph Company". Across the world, the experiments were continued on board his steam yacht Elettra, which had been specially equipped. He was awarded the Nobel Prize for Physics (1909) for the development of wireless telegraphy. In 1914 Marconi was appointed senator of the kingdom and in 1930 chairman of the Academy of Italy. The day before his death - 20 July 1937 - he reported the results of his studies on some properties of the ultra short waves to Cnr. 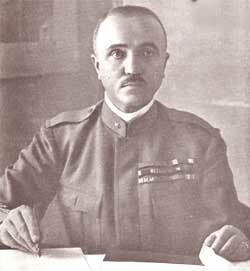 Pietro Badoglio (1871-1956), president of the National Council for Research from 1937 to 1941, he was made a field Marshal on 1926. He governed Libya from 1928 to 1934 and he assumed command of the Italian forces in Ethiopia in 1935. Upon the downfall of Mussolini, in 1943 Badoglio became prime minister and he arranged for an armistice with the Allies. Giancarlo Vallauri (1882-1957), president of the National Council for Research from 1941 to 1943, he was naval Staff officer, graduated in industrial engineering with post graduate studies in electrotechnics at the University of Naples in 1908. Professor of electrotechnics at the School of Engineering of Turin and Chairman of the National Electrotechnics Institute "G. Ferraris", Vallauri was member of the Academy of the Lincei, of the Pontifical Academy of Sciences and of the Academy of Italy. Francesco Giordani (1896-1961), president of the National Council for Research from 1943 to 1944, graduated in organic and inorganic chemistry at Naples where he became professor of organic chemistry and manager of the laboratory of electrochemistry of the same university. Giordani was Chairman of IRI, Cnr and CNEN. Gustavo Colonnetti (1886-1968), president of the National Council for Research from 1944 to 1956, was an Italian mathematician and engineer and his theories about Strength of materials found important applications in modern techniques of construction. He was a Rector of the Politecnico di Torino. In 1936 he was nominated member of the Pontificial Academy of Sciences and in 1948 he was elected member of the Academy of the Lincei. Francesco Giordani (1896-1961), another time president of the National Council for Research from 1956 to 1960, he was member of the Academy of Italy, of the Academy of the Lincei (of which he was Chairman from 1956 to 1961), and of the Pontifical Academy of Sciences. Author of researches in electrochemistry, Giordani invented with Pomicio a method which could be used in several country of the world for the extraction of the cellulose from the straw of cereals. Giovanni Polvani (1892-1970), president of the National Council for Research from 1960 to 1965, studied at the Scuola Normale Superiore of Pisa and in 1926 he won the chair of experimental physics at the University of Bari, where he taught for one year. In 1927, he went back to Pisa as professor of technical physics. Two years later, he moved to Milan where he held the chair of Experimental Physics at the public University, of which he then became rector. His research activity covered the great themes of classical physics such as electro-dynamics, statistical mechanics, etc. Just before the Second World War, Piovani felt the need to refine new instruments to give a positive course to the research on cosmic rays; just at the beginning of and after the war, he did everything to reorganize the research in physics and to fill the gap between researchers brought about by the destructions of the war. In 1947, he became Chairman of the Italian Society of Physics and he took up the management of the journal "Il Nuovo Cimento". Inspirer of the Cnr law reform of 1963, he closed the gap between scientific culture and humanistic culture, by introducing in Cnr also the behavioural sciences. Vincenzo Caglioti (1902-1998), president of the National Council for Research from 1965 to 1972, graduated in Chemistry at the University of Naples and became professor in the University of Florence in 1936. After only two years he moved to Rome where he taught for almost 40 years. He was elected member of the Academy of the Lincei and obtained the National Prize for Chemistry in 1957. Alessandro Faedo (1913-2001), president of the National Council for Research from 1972 to 1976, graduated in mathematics at the University of Pisa where became professor of mathematical analysis. He was among the first people who realized the deep impact that computers were going to have on research, so he promoted the creation of the Centro Studi Calcolatrici Elettroniche and, later, he founded, with the help of IBM the CNUCE (National University Centre of Electronic Calculus). He was Rector of the University of Pisa from 1958 to 1972 and he established the degree of Master of Science in Computer Science at Pisa in 1969, the first degree in Computer Science in Italy. Elected Senator, he served two terms in the Italian Senate. Ernesto Quagliariello (1924-2004), president of the National Council for Research from 1976 to 1984, graduated in Medicine at the University of Naples where in 1954 he taught biological chemistry. He was a Rector of the University of Bari from 1970 to 1977. In Bari he founded the Institute of Biological Chemistry, which became an international scientific body. As researcher in the field of biology of mitochondrions, he received some important international awards. Luigi Rossi Bernardi (1932), president of the National Council for Research from 1984 to 1993, in 1958 he graduated in Medicine and Surgery at the University of Milan and in 1964, he got his PhD in Physics Biochemistry. In the 1970s, he distinguished himself in the field of respiratory physiology by cooperating with Italian, European and American research institutes. From 1974 to 1984, Rossi Bernardi was the scientific manager of the S. Raffaele Institute of Milan. In 1982, he was appointed member of the Commission for the biomedical research of the Lombardy region. Rossi Bernardi was also Scientific Manager of the General Hospital of Milan, one of the greatest Italian scientific bodies specialized in the biomedical research. Before becoming Cnr Chairman, he carried out activities of scientific Management for the body itself. Enrico Garaci (1942), president of the National Council for Research from 1993 to 1997. Professor of Microbiology and Rector at the University of Rome "Tor Vergata", graduated in Medicine and Surgery at the University of Rome "La Sapienza" in 1966. The scientific activity of Garaci is documented by over 200 papers published in international journals and he is editor of several books. Garaci boosted the development of the Italian biomedical research. For his researches, he got the prestigious prize of the Institute for Advanced Studies on Immunology of Washington. Before becoming Cnr Chairman, Garaci incessantly carried out for twenty years activities of scientific Management. Lucio Bianco (1941), president of the National Council for Research from 1997 to 2003, he was professor of Operative Research at the Faculty of Engineering of the "Tor Vergata" University of Rome. In 1966, he graduated in Electronics Engineering at the University of Rome and in 1970 he got also his degree in Space Engineering. Lucio Bianco carried out for 26 years management activities in the National Research Council. From 1972 to 1981, he was member of the National Committee for Engineering Sciences and Architecture as well as of the National committee for Technological Researches. From December 1980 to April 1997, he was Manager of the Institute of Systems Analysis and of Computer Science of Cnr. From July 1981 until his appointment as President, he was manager of the Transports Targeted Project. He's currently member of the Editorial Board of national and international scientific journals and he has carried out management and professional consultancy activity for many organizations. From June 2003 to June 2004 Adriano De Maio (1941) was Commissioner of CNR with the task of reforming the national research body. After a long-lasting academic and scientific career and a nine-year rectorship at the Politecnico di Milano, De Maio moved to Rome in October 2002, having come into the office of Rector of Luiss Guido Carli, where he is also Full Professor of Innovation Management, Faculty of Economics. Beyond his membership in many Scientific Committees and Board of Directors of major companies and associations, all through his career Adriano De Maio has published more than 40 among books and articles. Fabio Pistella (1944), president of the National Council for Research from 2004 to 2007, he was Professor at the Faculty of Engineering of the "Roma Tre" University; Director General of ENEA (Italian National Agency of New Technologies, Energy and the Environment); President of the public holding company REL, of APRE (Agency for the Promotion of European Research) and of CERSE (Committee for the Research on the Electrical Sector); Member of the Board of Directors of AIRI (Italian Association for Industrial Research) and of IEFE (Centre for Research on Energy and Environmental Economics). He was Administration Director of GRTN and CIRA (Italian Aerospace Research Centre); CNR Sub-Commissioner; Advisor of the Ministry of Education. He represented Italy in the European cooperation initiative Eureka, took part in several collective bodies of the EU, such as CREST (Committee for Scientific and Technological Research) and international bodies aimed at the cooperation in the research sector. Federico Rossi (1948), president ad interim of the National Council for Research from August 2007 to March 2008. Professor of the academic course on Management of Energy Systems at the University of "Federico II" of Naples, and former Dean of the University of Cassino, Director of the Institute of Electronic Engineering of the University of Salerno, General Secretary of CRUI, President of the National Network of Evaluation and Verification Committees on Public Investments. Among other public offices: undersecretary of state to the Ministry of University and Research under the Dini Government, advisor to Minister Luigi Berlinguer in the first Prodi Government, with special charge for chairing the Technical Scientific Committee for the Economically Challenged Areas and coordination of education, research and scientific training in the South of Italy; advisor for Professional Education Policies of the Ministers of Labor, Antonio Bassolino and Cesare Salvi, in the D'Alema Governments. Luciano Maiani (1941), president of the National Council for Research from March 2008 to August 2011. He graduated in Physics at La Sapienza University of Rome, where he became Professor first in Institutions of Physics and to follow in Theoretical Physics. From 1993 to 1998 he is President of INFN where he promotes and manages the building of the VIRGO Observatory in cooperation with the French CNRS. In 1998 he became President of the Council of CERN, and to follow from 1999 to 2003 CERN Director General, developing the construction of the Large Hadron Collider ( LHC), the greatest particles accelerator in the whole world. From 2005 to 2008 he coordinated the training project HELEN-EuropeAid. Member of the Academy of the Lincei, of the National Academy of the Sciences ( known as XL) and of the Russian Academy of Sciences, fellow of the American Physical Society and member of the European Academy of Sciences and Arts, he is author or co-author of over 150 scientific publications which have been quoted over 12,000 times: among the most important results, the breakthrough in the study of a new family of particles containing the charm quark. He has been awarded numerous prizes, among which the Dirac Medal, and honorary degrees. Francesco Profumo (1953), president of the National Research council of Italy from August 2011 to January 2012. He graduated in Electronic Engineering at the Polytechnic University of Turin, where he later became Professor and Dean of the Faculty of Engineering and, from 2005, President of the Board of Directors and Rector. He worked for the company Ansaldo, has been Professor at the University of Bologna and published over 250 papers on scientific journals and proceedings of international conferences on the sectors of energy and electronics. He has been awarded numerous international prizes and has been visiting Professor to many universities; he is member of the Academy of Sciences and of the European Academy as well as President of Columbus. He has been member and Chairman of international conferences, of the G8 University Summit 2009 and of the IEEE. He has been member of the board of EPE Association, Sole 24 Ore, Fidia Spa, Telecom and Pirelli, of the advisory board of Innogest Fund and Reply Spa, as well as of the board of directors and of the Consulting Divisional Committee of the Unicredit Private Banking. Since 16 November 2011 he was Minister of Education, University and Research of the Monti Government. Luigi Nicolais (1942), president of the National Research Council of Italy from February 2012 to February 2016. Professor Emeritus of Polymers and Materials Science and Technology at the University of Naples “Federico II” where he graduated in Chemical Engineering, he founded and directed numerous research structures and technology transfer centers. He is member of scientific associations and editorial boards of the most important journals in the field. He has written 10 books and published over 500 papers and he is author of 25 patents. He is one of the Italian scientists with the largest number of citations in international scientific journals. As elected member of the Regional Council of Campania, he was responsible for the Region's scientific research, technological innovation and new economy. He was elected member of the Italian Parliament, where he has been Vice President of the Parliament's Culture, Science and Education Commission. He was Minister of Public Administration and Innovation.